As I was busy last evening returning a myriad of emails regarding the near-term outlook for gold and silver, I was suddenly hit with the realization that we really are actually BACK in a bona fide, brand-spanking-new bull market in gold and the gold miners. After doing this for nearly four decades—riding these massive cyclical swings in the resource sector and nearly/totally losing my mind—I have developed an indicator that can best be described as an "ad hoc" indicator that is totally based upon my interpretation of human emotion and one that cannot be quantified. The reason is so difficult to quantify is that it is so totally subjective and completely devoid of any form of objective analysis and, sadly, 100% reliant upon my ability to correctly assess the levels of "fear" and "greed" that dominate the precious metals arena. At this particular meeting around June of 1987, you could SMELL the GREED in the room and cut the financial hysteria with a knife. Every discussion by various pods of people was stock-centric and the decibel level was like the floor of the old Chicago Mercantile Exchange pork belly pit. As for me, I was up there at the bar (no surprise here, move along) holding court with what must have been 25 people in a crowd at least five-deep all shouting questions like "Whadd'ya think of Magna?" or "We gonna see 3,000 Dow by Labor Day?" or "What about calls on Royal Trustco?" (RT went BK about five years later) and when it was all over and I realized that my beer had actually gone warm at half-empty, I was struck with an epiphany: The stock market was going to crash. Well, you all know what happened on October 19, 1987, so I won't bore you with how much money I actually LOST (I was long gold miners instead of gold—TSE Gold Stock index got cut in half while bullion prices went up 20% in 10 days) but the point of the exercise is that this uncanny ability to sense "crowded" trades and "exaggerated sentiment" has kept me out of the glue more than a few times in my career and while not exactly perfect, it is a pretty reliable tool, despite the fact that I can't explain it. Where we are today, I believe, in the context of the "New Golden Bull," is very, very difficult to assess and especially for a long-standing gold "bull," like me, to assess. On the one hand, the majority of the people I liaise with are , like me, inherently hopeful/convinced/rabidly sure that we are now in a new bull market that is going to a) make them rich, b) make them smart, c) make them incredibly attractive, and d) make them invisible. (Yes, "invisible," kind of like "The Four Stages of Tequila"). The problem I have today with being fully exposed and "all-in" gold and gold stocks is, in addition the reason I alluded to in my short-term outlook from the weekend, is that there are thousands of hedge fund managers out there that not only had horrible years in 2015, they have started the 2016 year off even worse; nothing worked for them. It didn't matter what they touched, every asset class was down last year. This year, up until Jan. 19, it looked like stocks were going to tank and take the gold miners with them, but here we are in March and the only thing "working" is gold and its equity-based brethren. So, in order to avoid the hedge fund version of venereal disease, REDEMPTIONS, they have all begun to pile into their new best friend, the "GOLD TRADE" and now every fund manager and TV commentator are hiding in the safety and comfort of this trade because their competition is there and as we all know, these guys hate being first (or last). They just want to hide in the safety of the crowd where that extra 0.6% that being long the "GOLD TRADE" gives them is 0.6% that their competition won't beat them by in performance. They are "hugging the benchmark" and don't particularly care whether gold goes up or down, as long as every other fund owns it too. Conclusion: They are now chasing gold out of fear and that is not good. To wrap this up, I sense that there is an ever-increasing number of hedgies out there that are become ever-so-fearful that they have missed or are missing that oh-so-important alpha-generating "Trade of the Year" that allows them to avoid putting up their redemption "gates" because they are still long Amazon and Valeant and Netflix while being agonizingly mired in YESTERDAY'S TRADE. 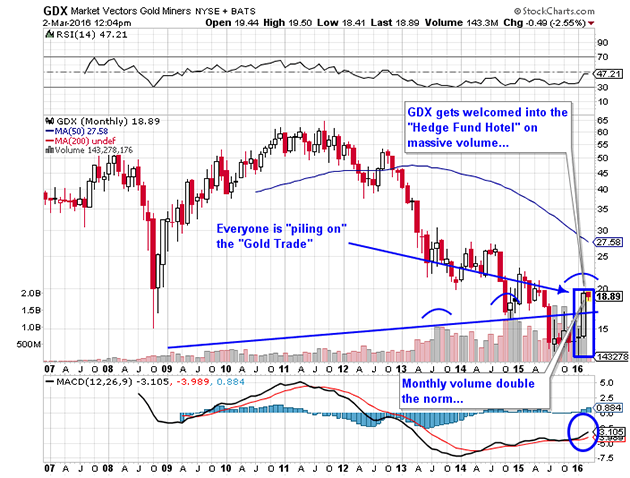 With that sense of desperation has come the amazing spike in volume in the Market Vectors Gold Miners ETF (GDX) in January and particularly February, which has driven the RSI and MACD to multiyear overbought extremes. Now, in the past five weeks I have seen all of the CNBC Fast Money gang turn suddenly gold-bullish; Cramer is now claiming the trade as "his own" and Dennis Gartman is now "long of gold in U.S. terms"; the only thing missing is Simon Hobbs sporting a "Gold $5,000" baseball cap. I have chosen to refrain from adding to longs and in fact I have taken out a few hedges by way of the SPDR Gold Trust (GLD) and Direxion Daily Gold Miners Index (NUGT) puts which are still only partial positions; I am now heeding the astrological signs and look to March 11 as a potential "turn day" for the metals and the gold and silver miners. We'll see what the Commercials have done this Friday, but the with open interest rising every single day, you have to assume that it can't be friendly. So tip a glass of bull market cheer as we welcome the late-comers to our world of wonderment in sound money and hard assets; the MSM will now be transformed from agnostics and antagonists to bandwagon jumpers as they take ownership of the magical world of gold. As they move to the podium to take their bows spotlights beaming, you and I will be waiting in the wings with two suitcases full of cash, an airline ticket, a fake nose and moustache and a silver limo waiting outside the convention hall doors. . .